Sensei Aaron Blackwell, he began practicing the Japanese Budo in 1972 and in 1974. While Blackwell has studied several martial arts today his main interests are in Aikido and Kyudo. He is president of the South Carolina Kyudo Renmei, is one of the people who has a greater degree in the Americas and is the representative of the IKYF for Latin America. Kyudo is the study of the Japanese longbow. However it is much more than archery. In addition to physical technique Kyudo has a strong mental aspect. In the mid sixteenth century firearms were introduced into Japan. The bow rapidly became obsolete as a military weapon. 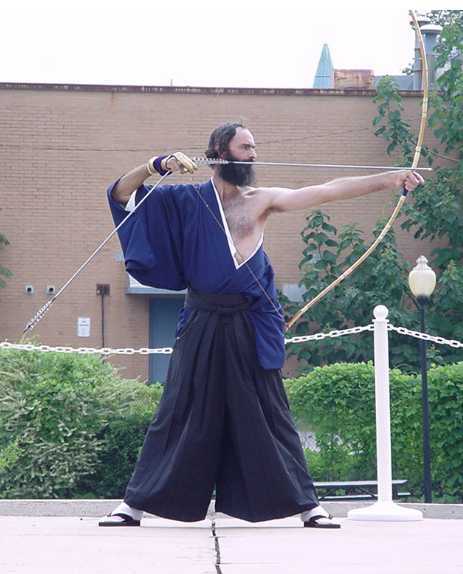 However the samurai realized that archery had value in and of itself and retained it with a focus on spirit training. Today spirit forging (seishin tanren) is an important aspect of Kyudo. Historically there have been two branches of Kyudo, a military branch and a ceremonial branch. Modern Kyudo combines aspects of both branches. We use the military style of draw but incorporate ceremonial aspects as well. In fact etiquette is an important part of modern Kyudo.